Just because you need to suit up in the summer, there is no need to revert to black or navy why not add some fun patterns, or rich coral shades or maybe opt for a lighter tone and feel ……. 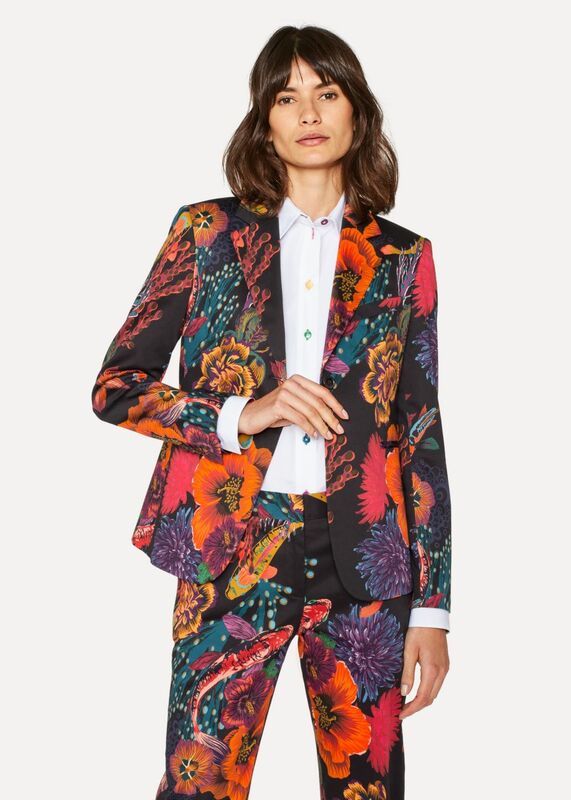 Constructed in Italy from a soft-handle stretch-cotton cloth, this black one-button blazer features a vibrant 'Ocean' print all-over. Complete with dark brown buttons, this classic single-vent jacket is expertly finished with a notched lapel and contrasting navy and turquoise Melton wool under-collar. 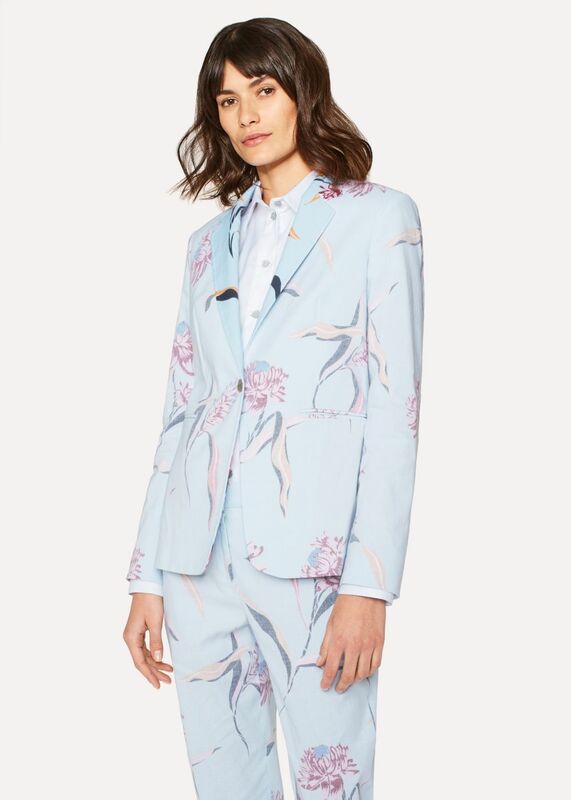 Wear with the matching Black'Ocean' Print Stretch-Cotton Trousers Crafted in Italy from premium cotton with a slight stretch for added comfort, these black trousers feature an all-over vibrant 'Ocean' print, perfect for making a statement this summertime. Finishing at the ankle for a modern, elegant silhouette, these classic-fit trousers come complete with colour-flash internal detailing and a lockable RiRi zip fly with hook-and-eye fastening. Constructed in Portugal from a 100% wool-hopsack cloth, this coral one-button blazer features a notched lapel with a contrasting burgundy Melton wool under-collar. This classic single-vent jacket is expertly finished with panelled purple colour-flash linings - complete with pink 'Enso Floral' print panelled detailing. 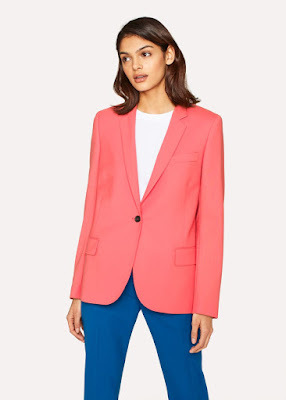 Wear with the matching Slim-Fit Coral Wool-Hopsack Trousers Constructed from 100% wool-hopsack cloth with crease-resistant properties, these slim-fit coral trousers finish at the ankle for a modern, feminine silhouette. 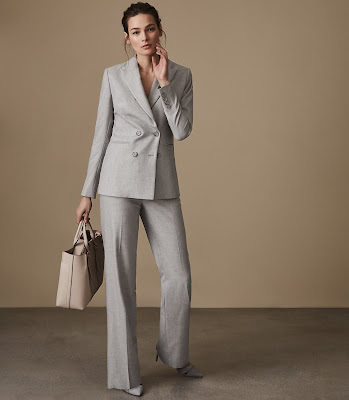 The Estie double-breasted blazer in grey is a feminine take on a traditionally tailored design. It features peak lapels, a four-button fastening and two welted front pockets, offering a distinctly retro feel that's sure to make a statement. Wear it with the coordinating trousers to complete the look. The Etta jacket in apricot-blush is tailored to a slim-fit silhouette and fastens at the front with a single button. This piece is also partially lined, demonstrating expert craftsmanship. Wear it with the matching trousers and a silk blouse for a smart, office-ready look. Make the Rodeo your statement blazer of the season. It's adorned with engineered stripes which add a contemporary touch to its slim-fit silhouette. 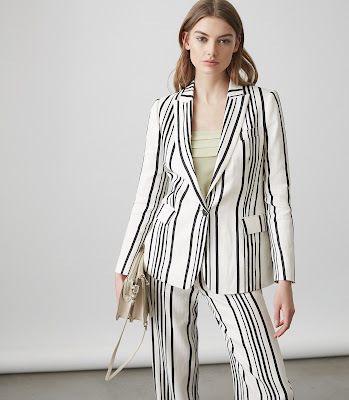 Wear it with the matching wide-legtrousers for a bold, sartorial tailored look. Fits large to size, take one size down.